There have been two recent Image comics that have dealt with a group of teenagers in typical “coming of age” type stories, often homaging back to the ‘80s teen movies done by Rob Reiner and Stephen Speilberg. However, each book appears to be taking a different approach and it’s interesting to compare and contrast between them. Plutona is by Jeff Lemire and Emi Lenox, with colors by Jordie Bellaire. The story involves a group of five kids in Metro City: Mei, her younger brother Mike, her friend Diane, bully Ray, and social outcast Teddy. Teddy, it turns out, is a “capespotter” — he dutifully records the appearances of each one. Except at the end of the first issue, the five kids find something in the woods: the dead body of Plutona, a superhero. Yes, it’s Stand by Me with superheroes, but the story itself has some great characterization and build up. Each character feels incredibly real and not just some cut out from an ‘80s teen movie. Mei is friends with Diane, but she also seems to take her for granted; Ray is a bully, but for reasons it turns out are quite tragic, with a horrible home life (and yes, he is our John Bender for the book); and Teddy, well, Teddy seems to want nothing more than to be a superhero. Lemire’s writing is excellent and Emi Lenox’s art is astounding (Bellaire is, of course, on point, like all the other comics she colors). 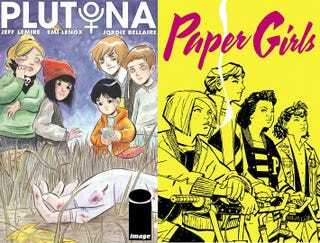 And Lemire writes and draws a backup strip for each issue called Plutona’s Last Adventure. Paper Girls is by Brian K. Vaughan and Cliff Chiang, with colors by Matt Wilson. The story is about four twelve-year-old girls who deliver newspapers: Erin, Mac, Tiffany, and KJ. The story actually starts in the morning of the day after Halloween in 1988, with Erin delivering papers on her route when she encounters the rest of the Paper Girls. Together, as they ride through town on their bicycles, they encounter someone that looks like a monster...and something strange that looks awfully like a spaceship. In fact, Image has described the comic as “Stand by Me meets War of the Worlds,” but, again, it all works. Each girl gets good characterization, with Erin (the rookie) and Mac (the “bad” girl) getting the most of it and the mystery slowly unfolding makes everything incredibly suspenseful. Matt Wilson’s colors also clearly define everything, giving everyone the purplish glow of the semi-darkness of pre-morning. Both of these books could be considered coming of age stories: one of them mixed with the superhero genre, the other mixed with science fiction. They contain homages to various ‘80s teen movies, like Monster Squad and ET. And both are incredibly good. I would recommend reading them both.